One of the most successful fragrance lines to ever launch has been DKNY Be Delicious and its never-ending flankers. (The technical name for those limited edition range extensions that boost the overall fragrance’s positioning and relevance.) Every year DKNY launch a new incarnation of the concept based on our universal love for New York City, and this Spring they’ve turned up the heat and developed a trio of scents inspired by the neon lights and parties of the city that never sleeps. Definitely a world away from the delicate and sweet ‘ice cream’ inspired fragrances of last year, these three perfumes are bright, bold and fearless. I have a long-standing relationship with the Be Delicious franchise, so I’m always excited to see what they have up their sleeve – and although the packs won’t be for everybody, the juice itself definitely don’t disappoint. Citrus Pulse, Bright Crush and Loving Glow together provide a trio of scents that are wearable, subtly unique and universally appealing; Be Delicious somehow manages to transcend generations, tastes and styles like no other fragrance line. The orange Citrus Pulse features nectarine, tangerine, passion fruit, jasmine, frangipani, magnolia, musk, woods and benzoin, providing an energising take on the original. This is definitely a spring scent and one for fans of fruity fragrances, but most similar to the original green apple is Bright Crush (green.) Formulated with notes of melon, bergamot, currant, plum, frangipani, peony, golden amber, vanilla and creamy woods, this is a punchier version of the classic. Finally, Loving Glow (pink) contains notes of grape, currant, pineapple, apricot, vanilla, amber and musk; the result is a warm, sweet scent that remains elegant thanks to sophisticated notes of violet and jasmine. Although I’m not a huge fan of the super bright bottles (they remind me too much of glow sticks and my university days!) there’s no doubt that the scents themselves are gorgeous. Who knows, the boldness of the caps may introduce a whole new generation to the deliciousness of DKNY, while keeping us long-term addicts hooked too. What do you think of these new Be Delicious scents? Will you be snapping them up when they launch? 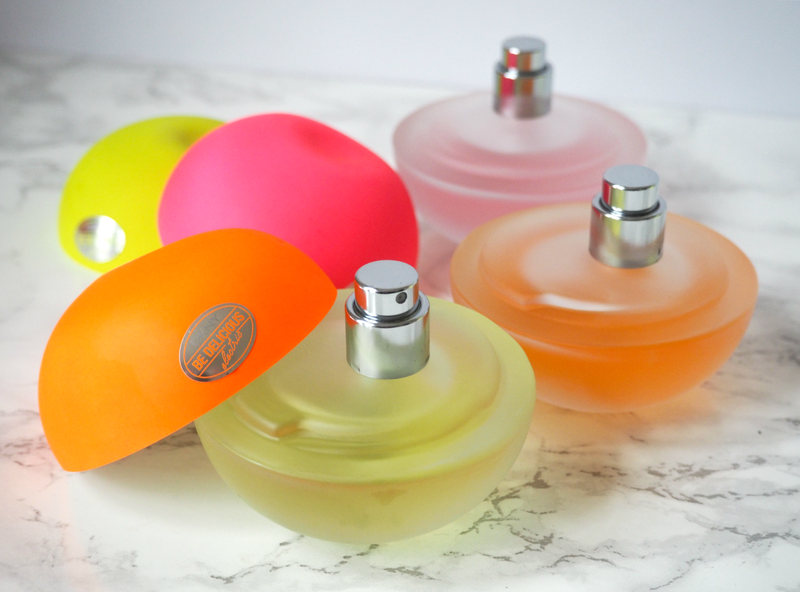 The colours are so bright I don't really see a lot of perfumes like that, they look so cute!